After a few months of workshops and design interations, it is finally time for the field-based use of the LiveResponse prototype with the Roadsmart application. 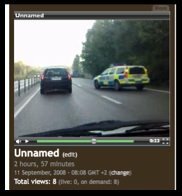 Since september 2008, a small project team together with users and representatives at the Gothenburg Fire and Rescue Services, the Paramedics (OLA-Unit) at Sahlgrenska University Hospital, and the Swedish Road Authorities has been working intensily to form a practical and highly functional prototype based on mobile video broadcasting capabilities. The project has collaborated with personnel at Bambuser to re-package core services from Bambuser into an application for emergency responders. Likewise, the project has also worked closely with technical expertise at the Road Authority to embed live video feeds from the traffic web-camera system in the Gothenburg region. Since a few weeks, preparations has been made to finally use the LiveResponse Prototype in real work. The LiveResponse prototype will be used for two months at the fire and rescue services command centre, by the incident commanders, by paramedic teams (OLA-Unit), and at the regional traffic management centre. LiveResponse consist of an webbased application providing live video feeds from traffic cameras as well as from mobilephone cameras. By using stationary and mobile cameras, the end-users will be able to access and share live video streams in order to reach an improved situational awareness in emergency response work. During the evaluation/field phase, the accidents in focus will be traffic accidents. 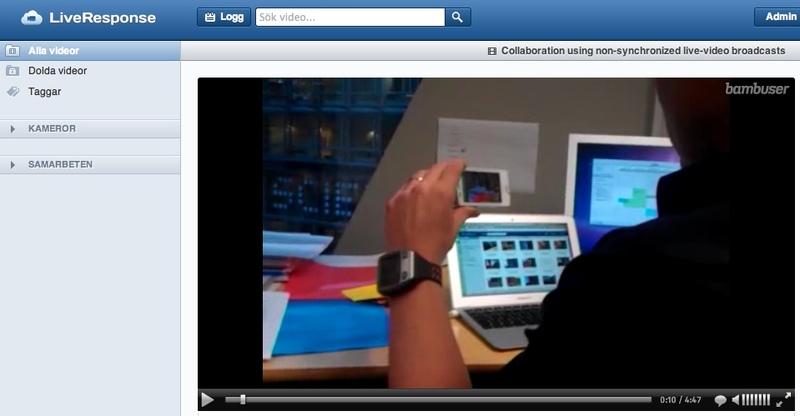 An improved version of LiveResponse will be shown in the demo session at ISCRAM 2009 Conference in Gothenburg. For additional uppdates on the ISCRAM 2009 Conference please see www.iscram.org. On Monday, I had a half day meeting with a group of researchers from University of Aarhus in Denmark. They presented a study on interactive collaborative systems for improved situation awareness and coordination in public events. As part of the EU-project Palcoom, they designed an impressive system that helped public safety actors (police, fire services, paramedics) to coordinate and control emergeing situations during the Tallships Race 2007, at a stop-over in the Aarhus harbour.They used interactive wall displays with digital representations of the event area, mobile phones for positioning of personnell as well as video streaming and photo sharing to the command centre. Preben Mogensen (Aarhus univ), Margit Kristensen (Aarhus univ), Michael Christensen (Aarhus univ) and Boris Magnusson (Lund Univ). Their study showed how the use of wall-size displays togehter with mobile devices as data feeders could provide a common operating picture for the response actors. At the meeting, myself and Urban Nulden (IT-univ, Göteborg University) presented the public safety research done in collaboration between the Viktoria Institute and the IT-university at the Göteborg University. Personal mobile broadcasting is now about to really take off. It has been sometime since Justin.TV made big headlines in media as one of the first individuals that had personal mobile broadcasting capabilities. 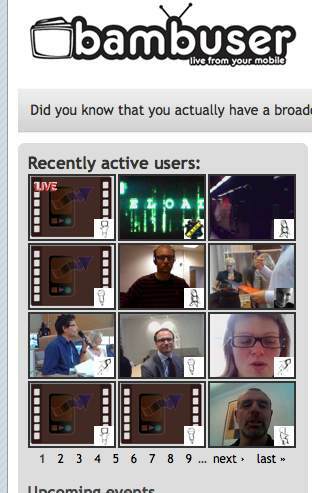 Now everyone can become their own broadcaster. A few months ago I came across Pocketcaster from ComVu (Now LiveCast). The easiness of setting up the broadcasting service was impressive. Since then I have worked on the design of a research study where the focus is to explore how personal mobile broadcasting could be used in an emergency response and crisis response work setting. Just the other day, some students mentioned Bambuser. Tonight, I signed up on Bambuser and within a minute I was up and running with the extremely straightforward broadcasting service. The use of such mobile broadcasting services has clear value in a range of personal and professional settings. From my perspective as a researcher in the domain of IT-design for emergency and crisis response, personal mobile broadcasting could have significant impact on future time-critical collaborative work. My initial field experiments using livecast has shown that power-consumption on the mobile phone is significant when broadcasting, but the most important obstacles in making broadcasting technology as success story is not in the technology but in organizational and work practice issues. From a first responder perspective, police, fire and rescue and paramedics, they all rely on very different legal grounds. Legal aspects are very different for the various response organizations, which also has a direct impact on the potential use of personal mobile broadcasting technologies. Apart from first responders, personal mobile broadcasting could also become a key technology in regional as well as national crisis response work. A key concept these days are “common operating picture” that from an technical perspective promise that all relevant data can be provided in a unified way using geographical maps as the background material. When the COP-people understands how well personal mobile broadcasting works already today, they will become thrilled on the range of possibilities that opens up. Have you ever had the chance to look into formal documentation made by emergency or crisis responders at on-scene-command or in command centres? Have you payed attention to the amount of temporary and temporal contact information that they need to handle? Such temporal contact information is typically names of people and their associated mobile phone numbers. The importance of these temporal contact information should not be underestimated for the ability of organizing response work. However, the temporal contact information is often difficult to distributed across the response network, and contact information is typically gathered at different geographical locations. In a project by the Public Safety Research Group, we address this phenomena and will in the next few weeks conduct field experiments with incident commanders and command centre staff to further explore how to support the management of temporal contact information. Stay put and we will tell you more just before the summer.